Meha Priyadarshini, Chinese Porcelain in Colonial Mexico: The Material Worlds of an Early Modern Trade (Palgrave Macmillan, 2018), 198 pages. The global life of porcelain has been the subject of important scholarship in recent decades. Chinese porcelain, the subject of Meha Priyadarshini’s new book, has been treated either as a distinct topic or as one of numerous goods that tell entangled stories of material, commercial and cross-cultural contact around the world. Many studies, among them Robert Finlay’s The Pilgrim Art: Cultures of Porcelain in World History (2010) and Anne Gerritsen and Stephen McDowall’s special issue “Global China” in the Journal of World History (2012), have emphasized the impact Chinese porcelain had on the work of early modern European artisans, who sought to imitate its technique while also drawing inspiration from Chinese forms, patterns and motifs. It is widely acknowledged that in addition to taking pride of place in courtly and middle-class households in the West, Chinese porcelain and its European counterpart also helped shape crucial sites and practices of intellectual exchange and sociability in Europe, such as female-led salons as well as tea tables, where the taking of tea enabled the art of conversation to blossom. Priyadarshini’s book charts a lesser known course as it delves into the journey of Chinese porcelain through the transpacific trade between the Philippines and colonial Mexico. It is a welcome contribution to colonial and global history and offers a productive approach to the expanding field of material culture studies that investigates social and political narratives of objects in light of connectivity. The book tackles questions shared by cultural historians of modern Europe and Asia alike on the role played by global exchanges in shaping political, cultural, and social identities. It argues that the multifarious exchanges entailed by the transpacific trade of porcelain from China to Mexico via Manila helped carve out the political, social and aesthetic traits of colonial Mexican identity in contrast to Spanish identity. New Spain was transformed by the conspicuous consumption of Asian articles brought from Manila to Acapulco, which, the author argues, defined a peculiar colonial identity distinct from that of Spain. The book’s strength lies in its dynamic account of Chinese porcelain’s transpacific trade, seen as a “multi-sited narrative” (p. 15). It incorporates various protagonists in the narrative, such as anonymous Chinese potters in Jingdezhen, and offers minute descriptions of social and industrial activities: among them manufacturing porcelain in Jingdezhen, shipping it to Manila, packing it for the voyage made by the Manila galleons, selling it at the Acapulco fair, and finally transporting it to Mexico City to be sold at its famous Parián market. The book provides a vivid account of the many factors involved in having Chinese porcelain enter Mexican households. In addition to emphasizing trade, artisans and their skills, it includes often overlooked local histories that do not get recorded in larger meta-narratives. The book is organized in six chapters that map out a complex journey from China to Mexico, with stops on the way: Jingdezhen, Manila, Acapulco, Mexico City, and Puebla. The introduction elucidates the methodological and thematic framework. It makes a case for studying global history in local contexts, highlighting connectivity (of places and people) as a key concept for tracing the path of Chinese porcelain from Asia to Mexico. The focus on the Pacific Ocean, with Manila and China on the one hand, and colonial Mexico on the other, allows for a much-needed decentering of Europe that reveals a rich and vibrant culture in the Spanish colonies of the early modern period. The author’s methodology draws on both primary historical sources (travelogues, official orders from the Spanish Crown, notaries’ books of freight) and decorative as well as everyday objects to trace the transpacific voyage of Chinese porcelain to Mexico. The third chapter departs from the relative immobility of the previous chapter, by taking the reader on the first leg of the travels of Chinese porcelain from Jingdezhen to Manila. Contrary to remote and isolated Jingdezhen, Manila is represented as a bustling port city, where different cultures met and mixed. In order to understand the nature of the transpacific trade network, the chapter provides a rich history of the trading activities in Manila before Spanish colonialism, showing how the Spanish appropriated the precolonial trade structure to then expand their trade to Mexico. Chinese merchants played a significant part in developing commerce in Manila. The South Sea region had been the hub of commercial activities as goods from Nanyang were in high demand in China. The chapter also gives an illuminating account of the manner of packaging goods for maritime transport, revealing, along the way, illicit packing and contraband practices that testified to the success of the transpacific trade, as more goods were shipped to Mexico than were officially allowed. The fourth chapter, entitled “A Parián in the Plaza Mayor: Making Space for Asia in Colonial Mexico,” explores the specifics of porcelain consumption in Mexican society, arguing that the latter “made space” for porcelain goods, a term that entails dynamism and agency. While the previous chapters focused on production sites, trading venues, craftsmanship and commercial skills, this chapter investigates the integration of Chinese porcelain into the religious, artistic, and domestic life of Mexican society, while also considering the significance of its cultural use. The chapter shows how important trade with Asia was for colonial society, as evidenced by the fair organized in Acapulco on the occasion of the arrival of the Manila galleon once a year, and by the market, known as the Parián (named after the one in Manila), on Mexico City’s Plaza Mayor. The presence of porcelain is analyzed in multiple locations, from churches to markets and from sitting rooms to kitchens. The author also argues for a degree of agency on the part of colonial subjects who, despite the Crown’s orders to limit trade with Asia, refused to abide by the rules and continued their own use and artistic appropriation of Chinese porcelain. The use of Asian objects such as biombos (Japanese folding screens) and Chinese porcelain was instrumental in defining colonial aesthetics and cultural practices that were distinct from Spanish and native craft traditions. The focus on the consumption of hot chocolate, an activity shared by all social classes at the time, provides a telling example of an indigenous process of Sino-Mexican cultural transfer. In appropriating and repurposing Asian goods, such as Chinese tea cups employed as chocolate drinking vessels and referred to as jicaras, the colony developed its own sense of identity which differed from that of the metropole. The analysis of the representation of the Parián on a Mexican biombo convincingly shows a process of borrowing an alternative aesthetic to narrate the colony’s commercial and political history and claim its specific identity. The foreignness of Asian objects, the author argues, reinforced the distance between colony and metropole: “The colony […] was not hesitant to look to foreign forms to record its evolving history and memorialize the new spaces it had created” (p. 110). Fig. 1. 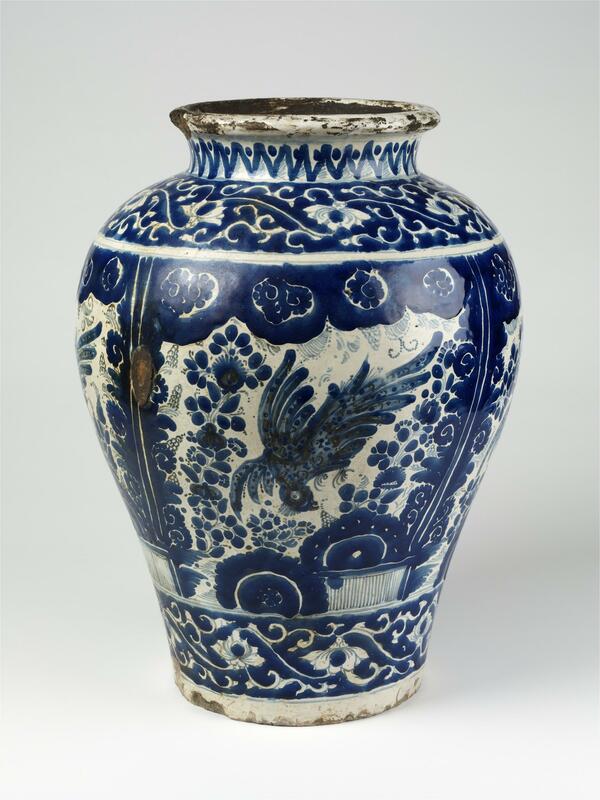 Large earthenware storage jar with tin-glazed decoration in blue and white in the Chinese style, c. 1700. 47.6 x 34.9 cm. Puebla. © Victoria and Albert Museum, London. The fifth chapter makes an original contribution to the scholarship on hybridization and orientalization by looking at the intersection of Asian and indigenous aesthetics in the production of ceramics in Puebla. Here, the author shifts from a focus on consumption to considerations of craftsmanship and artistic transfers. Priyardashini aptly shows how potters in Puebla created a style of their own inspired by Chinese, European and indigenous designs that made local talavera poblana the pride of the city and a symbol of Mexican art that could rival Spanish ceramic production. The case of chocolateros offers a stimulating example of hybridity in design. Chocolateros borrowed formal elements from the Chinese guan—among them its shape and some motifs of its surface decoration—and blended different aesthetic influences as shown, for example, in the replacement of the Chinese phoenix by the native Mesoamerican quetzal. The study of other talavera poblana jars reveals telling examples of transcultural contacts, such as the presence of both the nopal cactus and a Chinese crane on the same ceramic surface (Fig. 1). The conclusion recapitulates the arguments developed in the book and makes a strong claim for the Mexican use of Chinese porcelain, its local appropriation, as well as its imitation in local ceramic production, as a way for the colony to defy Spanish artistic and cultural authority and challenge its subservient position. If it does not opt for a strongly theoretical discussion, Chinese Porcelain in Colonial Mexico nonetheless offers a fascinating read that makes a convincing case for reorienting research in less Eurocentric directions. It offers a fresh contribution to scholarship on artistic transfers of Chinese porcelain by unveiling fascinating examples of hybrid chinoiserie. It also opens up new pathways to think of World History at the intersection of global history and more local, micro-histories. Cite this note as: Vanessa Alayrac-Fielding, “Chinese Porcelain in Colonial Mexico: A Review,” Journal18 (October 2018) http://www.journal18.org/3077.